Pinterest has gained an interesting reputation as being a social media platform only for women interested in crafts, recipes, and DIY projects, and for 16-year-old girls who want to plan their dream weddings. Because of this reputation, most men of our acquaintance wouldn’t consider touching it with a 10-foot pole. Social media is about the person, their likes, dislikes, and their life, and it allows for sharing those personal events and creating conversations. 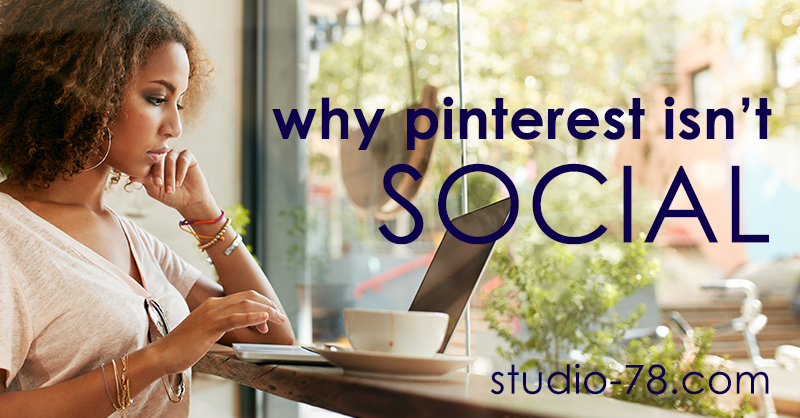 By comparison, Pinterest is impersonal because it’s not about the individual. It’s a resource to save and share ideas, much like an elaborate bookmarking system that other people can view. And yes, a full third of Pinterest users are men because there is so much more available than just crafts, recipes, and DIY projects—but we’ll get to that in a bit. How often have you heard the phrase, “Oh, I found it on Pinterest?” Pinterest is actually a visual search engine with powerful potential for your business. Along with quality graphics, “pins” are ranked according their titles and keyword-rich descriptions, allowing users to search for information and links much like they would search Google, Yahoo! or Bing. With every entry requiring a photo or graphic, searching for relevant information becomes a much more pleasant user experience. The millions of people who use Pinterest daily are searching for advice and ideas relating to every area of life—if you can name the industry, you can find something relating to it on Pinterest. Carpentry, engineering, fitness, finances, healthcare, lifestyle, marketing, the list goes on and on. But unlike Google and other search engines, if your business doesn’t have a “pin” floating out there, not one of those millions of users are ever going to find you. And that means your business is missing out on an incredible opportunity to connect with potential customers. Remember when we talked about how social media can create a user experience for your business? (link to previous blog, Social Media for Business) Just like a bank sharing advice on how to save for a particular goal is more likely to be noticed on a Facebook feed rather than a promotional image about opening a checking account, your business Pinterest profile should be a gallery of intentionally created and shared pins that all relate to the one-person audience. Focus on your audience and their needs and interests, gather excellent related pins, and start seeing a response. Of course, how can saving links to advice and ideas from other people positively impact your business? You also have to create and share links from your own website or blog as well! Sharing valuable advice and ideas isn’t giving away your services for free, as it can build awareness of your company and generate trust toward your brand. Read the following example to see how. Let’s say you’re a fitness trainer, and you want to encourage more people to come to your gym for personalized fitness training. Writing up a good 20-minute at-home workout routine and sharing it through a blog or video may seem contradictory to your business goal of gaining more gym members—but we promise that it isn’t. You know that working out at home doesn’t have the same effectiveness as training with someone else there to correct your form, monitor your health and progress, and motivate you when you want to collapse. But if people find your one at-home routine on Pinterest and YouTube, try it out and get results, they’re now familiar with your company, they have a link to your website, and they will look for you first when they take the next step and join a gym. Building brand awareness and trust is what Pinterest and social media platforms can do for your business, no matter your industry, size, or location. Share advice and ideas about what you know and do best. Create a social media strategy about what you want to share, where you share it, and how often you post. Don’t know where to start? We’d be happy to help you identify and strategize how to utilize social media to positively impact your business marketing. Call us today and set up your Social Media Consultation! NextNext post: What is Responsive Design?